Martins Susters in action against Basingstoke Bison. 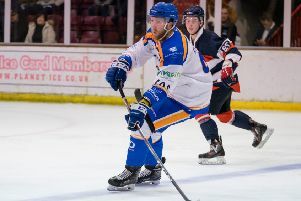 Martins Susters started the NIHL Division One South season in a team who only won four matches in the whole campaign – he could end it as part of a club with four trophies. The Latvian-born talent began 2018/19 with the rock-bottom Invicta Dynamos where any point gained was seen as a success, but a late-October switch to Phantoms also provided a major shift in his ambitions. Susters’ second spell in Bretton has already featured NIHL Autumn Cup and NIHL South Cup glory, but he is still eyeing further silverware as the NIHL Division One South play-offs reach the semi-final stage this weekend. Phantoms face Basingstoke over two legs for a place in the final – it’s a repeat of the NIHL South Cup final that they won 6-5 on aggregate – and the 20 year-old admits that two hours of total teamwork are a must. “We showed last weekend what can happen when we play as a team and everyone performs at their best,” said Susters, following the club’s 19-4 aggregate hiding of Milton Keynes Thunder at the quarter-final stage. “This is the play-offs and every man has to work hard for every minute of every game no matter who we are playing against. “If we manage to do that we always have a chance of winning and going on to the next stage. “Scoring the amount of goals we did last weekend is always good for our confidence and hopefully we can take that into the games against Basingstoke. Despite the huge success enjoyed this season, Susters admits there is a feeling of disappointment inside the Phantoms’ locker room after they missed out on title glory. The city men eventually finished as runners-up, five points behind big-spending champions Swindon, but all thoughts are now firmly on what lies ahead. And Susters, who was part of the club’s last play-offs triumph at English Premier League level in 2015, admits a trip to Coventry for the NIHL Final Four – the end-of-season shoot-out between the top two teams in the North and South - would be a particularly sweet climax. “I knew I needed to have a change when I was in Invicta and coming back to Peterborough has worked out really well for me,” added Susters. “It’s great to be part of this team which has already won two trophies, but we are all a bit frustrated that we didn’t get the league title as well. “We know there are two or three games that we should have won and which would probably have made a difference, but that happens in sport. “We have to be happy to have won the two cups and we’ve now moved on to fighting for the two other trophies that are still up for grabs. “I have great memories from when we won the play-offs and it would be great to get back to Coventry again.